Carolyn lectures at museums, clubs, and universities across the country. Often invited to be a repeat speaker, one audience enjoyed her talk so much, they have asked her back 2 more times — to give the same presentation. To make arrangements for a presentation, contact Carolyn at cobagy@aol.com. A 'roads scholar,' Carolyn is a member of the Arizona Humanities Council Speakers' Bureau. To learn if your organization would qualify for AHC sponsorship for a talk, or for more information on this program go to www.azhumanities.org. English artist Nora Cundell (1889-1948), along with her sister Violet and brother-in-law Charles Eaton, traveled to Arizona to see the Grand Canyon in 1934. Nora had read descriptions of the canyon and northern Arizona written by her friend J. B. Priestley, the English author and playwright. Priestley and his family made several visits to the Grand Canyon, the Vermillion Cliffs, Painted Desert, and Navajo country. His writings intrigued Nora enough to plan a trip to America to see those places for herself. 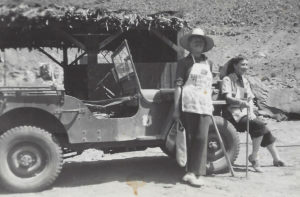 Nora Cundell, left, and Christina Klohr, right, 1947, Lee's Ferry. Courtesy of Bernice Klohr. Goldie Tracy Richmond came to southwestern Arizona in 1927. When she was 21 years old, Goldie married Marion Tracy, a man 42 years older, and on her wedding day she became a grandmother-and a great grandmother. In the Arizona desert, she and her husband lived in a canvas lean-to. 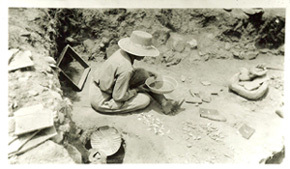 To make a living, Goldie mined for gold, ran traplines, and then opened Tracy's Trading Post where she lived among the Tohono O'odham people for four decades. She was an huge woman, at 6'4" tall and weighing 345 pounds, and the stories told by the O'odham people of Goldie's life on the reservation are legendary, such as the tale of the time when a bobcat attacked her elderly husband, and Goldie strangled it with her bare hands. In her later years, she made magnificent quilts with appliqué fabric images of the local landscape: Baboquivari Peak, prickly pear and ocotillo, and also scenes of daily Indian life. 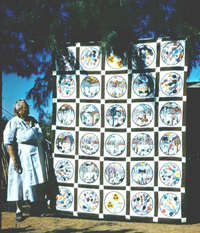 Two of her pictorial O'odham quilts are now in museum collections, and one was named one of the 100 most notable quilts of the Twentieth Century. Goldie spoke the Tohono O'odham language, and was known as an honest trader, and a friend to the native people. Her legendary story is a compelling chapter of Arizona history. On the sparsely settled Arizona reservation lands, trading posts were important centers for commerce, as well as social gathering centers. With a subsistence economy, the posts offered opportunities to trade sheep, wool, and crafts for necessities such as flour, coffee, sugar (known as "sweet-salt"), and tools. Most often, traders were Anglos, living as partners among their Indian neighbors. They often were the only contact with the outside culture, and their stores provided an outlet for local arts such as rugs, pottery, baskets, and jewelry. Traders helped with correspondence, transportation, sickness, and they even buried the dead. Trading posts were the sites of marriages and murders, they were destinations for artists, scientists, and adventurous tourists. With the coming of roads and automobiles, trading posts have all but disappeared, but the stories and photographs shared in this presentation give a glimpse into a vanishing time in the Southwest. John and Sue Bradley, Warren Trading Post c. 1930, Kayenta, Arizona. The story of Hopi textiles and the history of quilting on the Mesas in northern Arizona is an amazing tale. For centuries, Hopi men have grown cotton and spun and woven the fibers into blankets and clothing. With the coming of Anglo missionaries and government officials, quilting was introduced to the Hopi people in the 1880s, where quilts quickly became integrated into Hopi culture and ceremony. Quilts are used in every Hopi household, they are given at the beautiful dawn Baby Naming Ceremonies, and at the end of a Hopi's life they are used as a burial shroud. 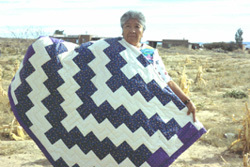 Hopi women and some men are 4th and 5th generation quiltmakers, and, as the artistic traditions of two different cultures are blended together, it is not uncommon to see a quilt with a traditional Anglo pattern and an ancient Hopi image, such as a kachina or a clan motif stitched on a quilt top. Along with a presentation that includes historic background and many new and vintage images of Hopi scenes and quilters, is an extensive trunk showing of Hopi quilts and textiles. 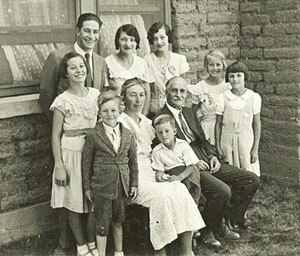 During a 1927 road trip to the Hopi Indian Reservation in northern Arizona, Maud and Carey Melville of Worcester, MA, met Wilfred and Ethel Muchvo, a First Mesa family. Following their first meeting, and subsequent visits, a lifelong friendship developed between the two families even though they were separated by distance and culture. This presentation portrays the lives of the Hopi people during the 1920s and 1930s, prior to the tremendous changes brought about by the U.S. government, anthropologists, and tourists to Hopi communities on the three mesas. 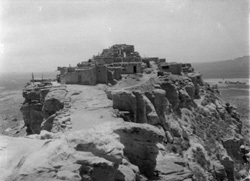 These changes are viewed through years of correspondence from Ethel Muchvo, research, interviews, oral histories, and examples of arts and crafts augmented by breathtaking vintage photographs from each of the mesas. This snapshot of history tells of the friendship between the Melvilles and the Muchvos, a poignant and memorable story of Hopi life. As one Hopi elder recently commented, "This is our history." 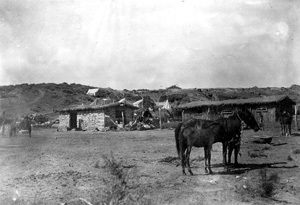 When John and Louisa Wetherill went to Kayenta in 1910, they were aware they were moving into lands occupied by Hoskininni's band of Navajos, who were known to be hostile to any Anglo intruders. The Wetherills befriended the local Navajos and often acted as liaisons between them and the U.S. government, interceding when troops were sent to suppress Navajo opposition to Washington policies. The Wetherill's formed lifelong friendships with Hoskininni who was known as the "Last Chief of the Navajos," and he called Louisa Wetherill his "granddaughter." Additionally, the Wetherills were hosts to an amazing parade of guests who came to see Monument Valley, Rainbow Bridge, and the huge cliff dwellings in the nearby canyons. Writer Zane Grey based his book, The Rainbow Trail, on the Wetherills and their trading post; scientists and archaeologists were based in Kayenta, Theodore Roosevelt and Everett Ruess were guests at the trading post, and artists such as Maynard Dixon, W.R. Leigh, and Lillian Wilhelm Smith returned year after year to paint the local people and the magnificent landscape of Kayenta and Monument Valley. Because of growing threats from the U.S. government, in the 1880s, the Mormon Church bought land in northern Mexico where polygamous families could live without government interference. Devout Mormon settlers, many who followed the practice of Plural Marriage, built homes in the Colonias in Chihuahua and lived peacefully until the tumultuous years of the Mexican Revolution. For the family of Bishop Anson Bowen Call, life on the Mexican frontier was remote and harsh, and when the fighting came they had to flee to safety again and again. During the war Pancho Villa and the troops of revolutionary generals, and renegades, crossed paths with the Call family, and General John "Black Jack" Pershing became a lifelong friend of the Calls after he led 10,000 American soldiers into Chihuahua in 1916. Told through memoirs and letters left by Julia Call, the fourth wife of the Bishop of Colonia Dublan, her story of work, sacrifice, and danger illustrates the life of devotion and sacrifice of the Mormon Saints in Mexico. 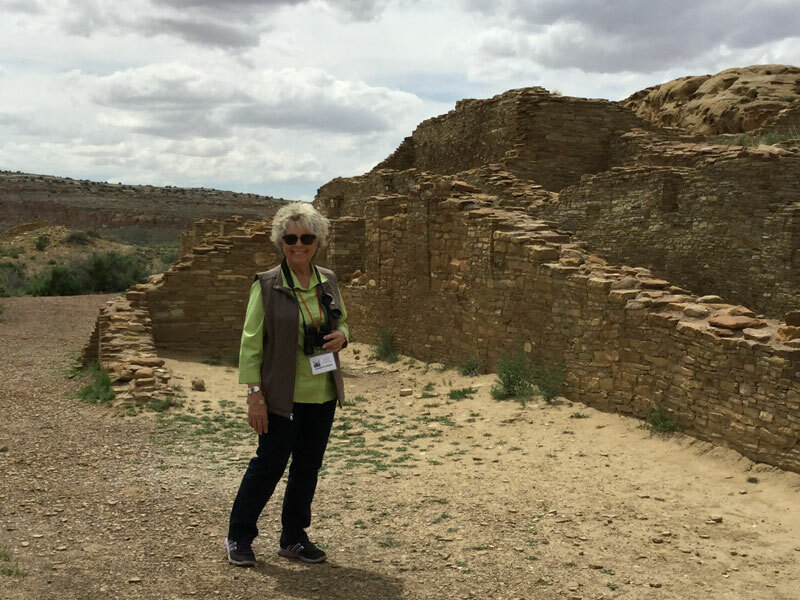 Additionally, Carolyn will share thrilling stories of trips to the Mormon villages in Chihuahua and the wild and unsettled Sierra Madres. Nat Straw was one of the last, true mountain men in the vast Gila Wilderness country. 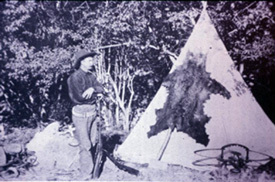 He lived with the Indians, prospected for gold in remote canyons, and hunted wolves and grizzly bears. He lived for decades without setting foot inside of a house or building, but he was legendary in the American Southwest, and his stories were published in national magazines. In pursuit of his life, Carolyn will illustrate stories of interviews with the last of the old-time cowboys and ranchers, as well as of dozens of horse packing trips into the Gila country that included flooded rivers, rattlesnakes, lightning strikes, and terrifying horse wrecks. Nat Straw's story is of a life that is only legend today, of times in the West that are gone forever. Burt and Hattie Cosgrove came to the west in 1907. In the southwestern corner of New Mexico Territory they soon discovered ruins and cliff dwellings and the traces of the long-vanished Mimbres Indians. The Cosgroves began to dig in the abandoned villages for the beautiful painted bowls that depicted intricate geometric designs and naturalistic images of people, animals, fish, and insects. But they soon realized that digging only for treasures would destroy the fast-disappearing remains of the Mimbres Culture. They developed precise and scientific methods for recording their excavations, and their careful work led to careers as archaeologists for the Peabody Museum at Harvard University. Later work took them to the remote painted caves in the unsettled Gila Wilderness country, as well as to the Hopi Indian Mesas in northern Arizona. Burt and Hattie Cosgrove began their extraordinary careers as amateurs, but are known today for the legacies of their pioneering archaeology in the American Southwest.